[IN] was our first International Customer Conference and we can now safely say that the bet fully paid off. Several dozen clients, prospects and market experts populated the twenty-ninth floor of Altitude London on the morning of December 2nd, inside the rather imposing Millbank Tower. 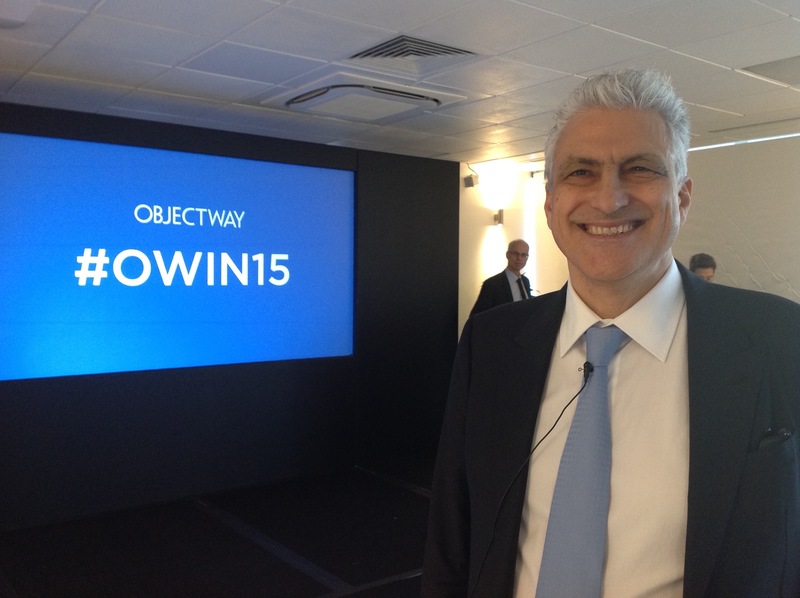 The right smile to kickoff Objectway IN. As you can imagine, breathtaking panoramas were on display through every window. The day, though, was designed to tell the story of Objectway products in a fast-evolving market, and soon people began re-directing their cameras from the windows to the slides and diagrams of the morning presenters. Thankfully we were able to overcome what would have been a major inconvenience for our guests: a shortage chairs. The problem was solved minutes before the kickoff, with the attendees none the wiser. 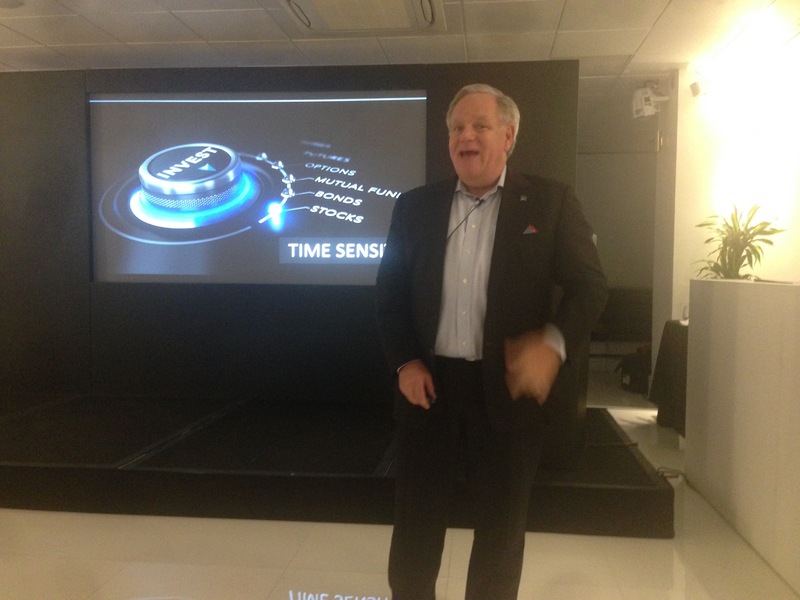 Everything else throughout the day went smoothly; nearly everyone stayed all day, from the opening speech of our CEO Luigi Marciano until the closing keynote of the energetic Jim Marous, a top industry influencer and mesmerizing speaker. (Follow Jim on his Twitter channel, it’s worth the effort). Alex Hamilton published a positive review of the day’s proceedings on IBS Intelligence. We received valuable insights in the morning from our partners Celent Research and Belgium-based Treetop. During the afternoon session, dedicated to our products, Objectway team members Alberto Cuccu, Koen Goossens, Andy Gorton, Phil Hales, Gert-Jan Hoogendoorn, Georgios Lekkas, Ed O’Leary, and Michele Tanzi skillfully doled out information that you normally would have to dig through product documentation to find. And their industry insights went well beyond that. Peter Schramme, an excellent master of ceremonies, was Shakespearian in directing the stage, with the power to instantly refocus attention from coffee breaks to presentations. 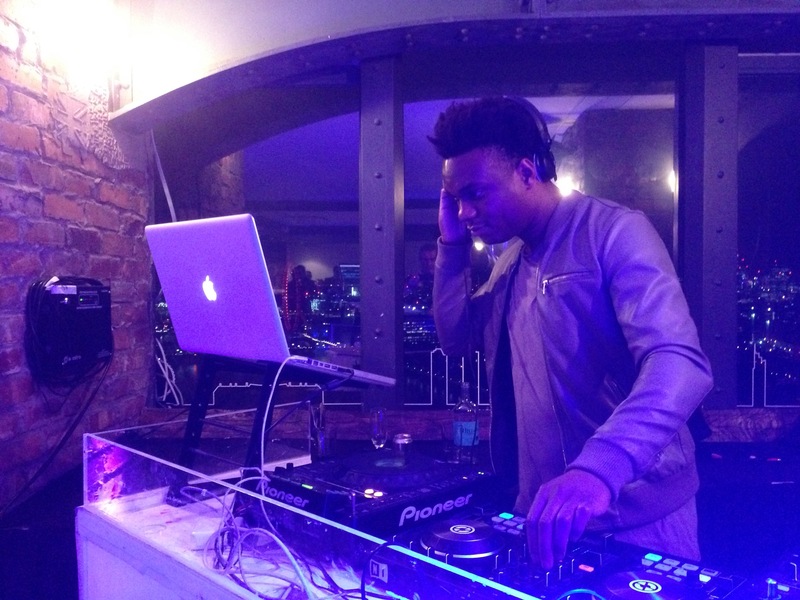 Following dinner, a celebratory mood took hold as everyone enjoyed a lively DJ set before eventually calling it a day. In the end, we were glad to have delivered a rich and interesting event for the benefit of our customers. Laura, Gilda, Chiara, Kalesh, Maya from our Marketing team never showed up on stage, but they did a truly terrific job ensuring that every detail was carefully worked out, from the earliest reception to the last goodbye. Processing all the materials we produced during Objectway IN will likely take a while, but we’ll gradually make everything available, here and through other channels. (Did we mention, by the way, that our new blog and social strategy were publicly revealed for the first time by Peter exclusively for our customers? While making your from this page, please take a look at our new community environment, too. We’ll use it to talk with you in the coming months. A lot!). 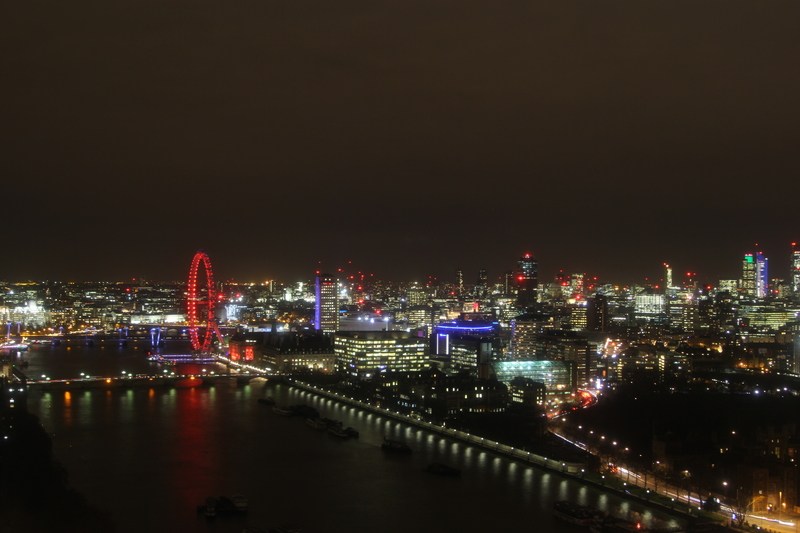 London by night, as seen from Altitude London. 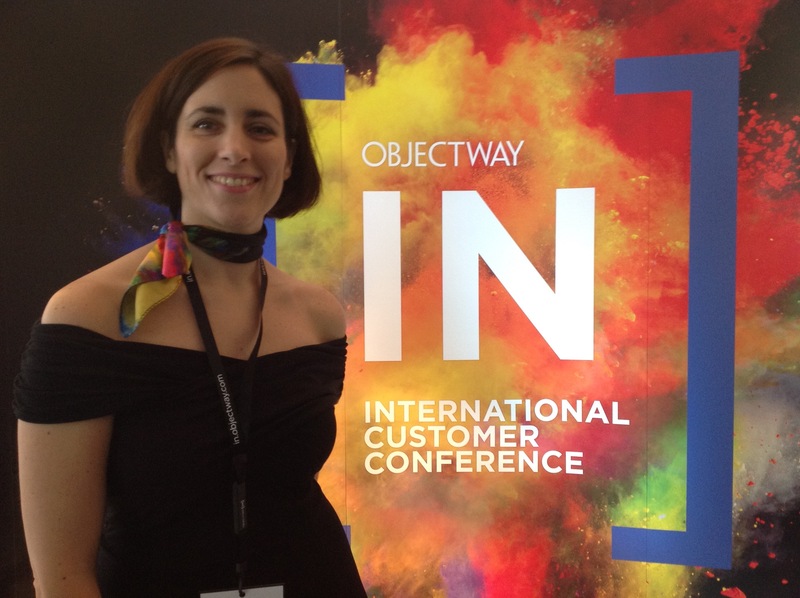 In the meantime, we want to express our gratitude, loud and clear, to our valued guests for their presence and support, and to the Objectway team for their excellent, and at times , work. This first International Customer Conference lays the groundwork for a great 2016 for our product lineup and for our customers as well. Thanks, everyone, and see you soon!